Each year, the New Castle County Chamber of Commerce gives awards to notable individuals in the community. The Lifetime Achievement Award honors the outstanding accomplishments of an individual who has had a substantial impact on the lives of members of the community throughout their lifetime body of work. Senator Margaret Rose Henry is known for her extraordinary commitment to public service with an emphasis on working to improve the lives of women, children, families, and the elderly. She was born on June 20, 1944 in Rayne, Louisiana and raised in Houston, Texas. Her father was a Longshoreman while her mother worked in a domestic capacity. Growing up in such a quintessential working family, Senator Henry realized the importance of education early on in life. When she earned a B.A. in Psychology and Sociology at Texas Southern University, she was the first in her family to graduate from college. She would also go on to earn her M.A. in Community Development and Leadership from Springfield College. Senator Henry most recently received an Honorary Doctorate Degree from Delaware State University in December of 2017. Senator Henry is the first African-American woman to serve in the Delaware State Senate, and is currently the only African-American and one of only four women serving in the chamber. She serves as Majority Leader of the Senate Democratic Caucus and represents the 2nd Senate District. Prior to her election to the General Assembly in 1994, Sen. Henry spent her professional career working in the nonprofit sector. She served in management roles with groups like Delaware Guidance, Girls Inc., Ingleside Homes, YWCA, and the United Way of Delaware. This diverse background in public service has given her an intimate understanding of the needs of the communities she serves. Sen. Henry’s focus as a legislator has always been on improving the lives of working families, children, women, and seniors. Senator Henry continues to work diligently on legislation that will have a positive impact on her district and the state as a whole. 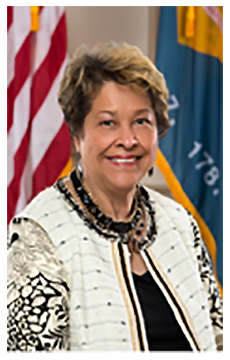 She has sponsored or cosponsored legislation restricting gun access for convicted domestic abusers, requiring mandatory reporting for lost or stolen firearms, levying stricter penalties for witness intimidation, creating Delaware’s medical marijuana program, prohibiting discrimination along lines of sexual orientation and gender identity, reforming child support laws, studying education reform in the City of Wilmington, broadening access to affordable housing, implementing a clean needle exchange program, increasing the minimum wage, closing the gender pay gap, protecting victims of child abuse, common sense criminal justice reforms, anti-bullying measures, and working to expand the Port of Wilmington. She continues to champion legislation in the areas of education, autism, health, housing, crime, gun control, mental health, and services for seniors. During her long tenure in public service, Senator Henry has earned recognition from all sorts of statewide organizations. Besides being nominated to serve as Majority Whip and then Majority Leader by her Caucus, she has also served on the Board of Trustees for the Medical Center of Delaware, Board of Trustees for Christiana Care hospital, the National Society of Fundraising Executives, and Wesley College. She spent time as a member of the Board of Interfaith Housing in Delaware, the Brandywine Professional Association, and chaired the Delaware Arts Council. She has been honored by the Delaware Division of Child Mental Health Services and has earned several awards including the YWCA’s Woman of the Century Award, the ACLU of Delaware’s Gerald E. Kandler Memorial Award, the Delaware Bar Association’s Legislator of the Year Award, the Alexis I. DuPont Bayard Award, and induction into the Delaware Women Hall of Fame.